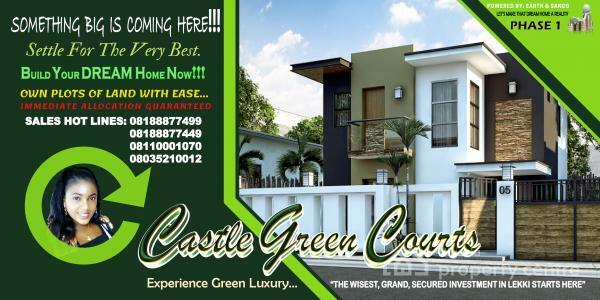 CASTLE GREEN COURTS: Valentine Promo Sales!!! area of Eti- Osa Local Govt. Area of Lagos State. This is one of our unparalleled finest properties which inculcates poise, absolute tranquility, grandeur technology and style. The Wisest, Smart, Grand, Secured Investment in Lekki Starts Here!!! Where Quality, Poise & Perfection Meets Class. at a pocket friendly price. It reflects that magical merging of inspiration and architecture. (Magnificent layout, visitors park, green area and co). If your plan is to have a nice perfect place free from the unending noise and chaos of Lagos metropolis, this estate is designed just for you! This is that time of the year when wise decisions in investing in the right outstanding Grand property and at the right price is your first option. infrastructure that cater to commercial, residential, educational and recreational establishments. A Guaranteed investment that assures all subscribers a certainty of an appreciation rate of over 250% Annually. Luxury Home Made Easy. This master- piece is sited in the most desired part of Lekki, Lagos and now currently the hottest and most expensive selling site in Lekki, Lagos now. Considering the current high appreciated cost of land prices behind new shop- rite/ novare mall, monastery part of Sangotedo Lekki. Valentine incredible slashed price CASHOUT PROMO. Promo Runs From The 1st of February Till The 28th of February 2019. •	Good Road Network. *Selling at =N17,000 per square meter. •	Gardens & Parks. etc. Location: behind the Largest Shop rite in West Africa (Novare Mall), off monastery road, Sangotedo area of Eti-Osa local Govt. Area. Of Lagos State, Nigeria. We are available for inspections and immediate allocation upon payment to serve you diligently without delays. Build that Masterpiece Now In The Hottest Part Of Lekki! Make that dream home a visible reality now!!! Instant Allocation Upon Payment Guaranteed. BUY NOW BUILD NOW!!! Providing Excellent Results and Bringing Massive Value to Your Investment Is Our Goal. Powered by Earth & Sands Transnational Ltd. The information displayed about this property comprises a property advertisement. Nigeria Property Centre makes no warranty as to the accuracy or completeness of the advertisement or any linked or associated information, and Nigeria Property Centre has no control over the content. This property listing does not constitute property particulars.The information is provided and maintained by Eas Transnational Links Ltd.